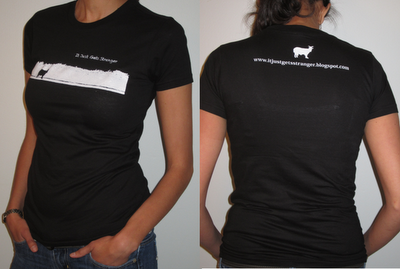 I have incredible news: We've made t-shirts. I know what you're thinking, "But Eli! I just bought 13 Snuggies! I don't even wear t-shirts anymore!" Rest assured, I have thought about this, and I too rarely wear clothing anymore, especially since I've learned several new ways to tie the Snuggie in the back, courtesy of Yahoo! Answers. Also, recently I discovered--you may want to be sitting down for this--the Snuggie is basically just a robe you put on backwards! (Or should I say, a robe is basically a Snuggie you put on backwards?). I know. Anyone who has had a robe, has had the opportunity to experience the Snuggie. I'm as upset that I lived so many years without discovering this as you are. Back to the t-shirts. My wonderfully talented friend Anna Swayne, who prints t-shirts when she's not too busy with her fight club or watching animal abuse commercials, has helped me out with some great new t-shirts. She presented the first one to me recently and I loved it so much that I wore it for 7 straight days without taking it off. You can imagine how uncomfortable it got when I took my Tuesday shower and had to wear a wet t-shirt until it dried 8 hours later. In any event, I'm quite confident that you'll love the shirt so much that you will be willing to wear it instead of a Snuggie at least once a month. We have a few different options available now, which you can find in the Store tab above. The shirts are really quite cool. 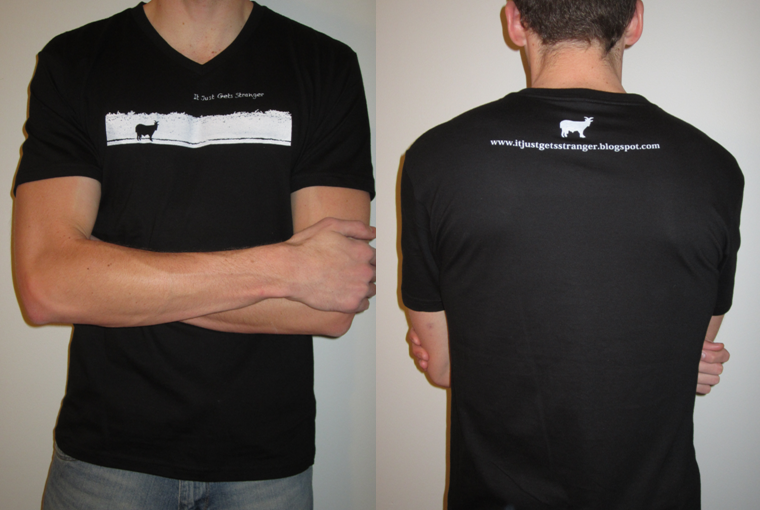 Apart from having the fun goat design we've all come to know and love, the shirts themselves are great quality and fitted so you'll look super hot for job interviews and stuff. Also, because I'm such an advocate for animals, you could argue that the proceeds in a way go toward raising awareness about good causes. Like proper treatment of The Queen of Colors. And defense against The First Eye. 1. Most states have laws requiring you to wear clothing. I didn't make the law. I'm just telling you you pretty much have to buy clothes because the government has gotten into your business. So it might as well be from us. 2. People will be super jealous of you. 3. Market analysis has shown that people who wear one of these shirts find a 200% increase in popularity among minority groups and ex-convicts. 4. If ever this blog becomes super famous, the hipster in you will have proof that you were into it before it was cool. 5. I'm told that these shirts help you lose weight. I haven't yet verified this, but it seems consistent with everything I've read. 6. You could take these and try to resell them for much much more, and since I'm quite easy to take advantage of, you could probably sell them back to me for much much more than I sold them to you. So, good business opportunity. My dear friends and I are making our modeling debut on the Store tab. If nothing else, that should peak your interest enough to mosey on over there and at least check the page out. There's a 95% chance we're all going to quit our jobs this week and pursue super-modeling. But I will not stop eating ice cream. Even if it means I'll never be an underwear model. We are starting out with some promotional rates, so buy soon before we raise the prices and you are forced to pay upwards of one million dollars just to look super trendy. One warning: as many of you are aware, my ineptness with what the kids call "technology" is so tragic that I should not be free, alive, or probably even happy. Hundreds of experiences throwing my phone against brick walls because it either vibrates or makes sounds without me telling it to (it's of the devil, I tell you), prove that this is true. So when you click on the Store tab, rather than be turned off by the terrifying design and tons of extra space, you should feel nothing other than extreme surprise that Eli McCann is responsible for making something on the Internet kind of work. I can hear Bob and Cathie bragging to the neighbors about their son's unimpressive achievements all the way from my house. If I buy now, I'll become addicted and then have to pay 1 million dollars later to get more shirts. Pretty smart business man, you are. Yes. It's sneaky, but I've heard this kind of thing works. Great... I feel like you gave me multiple choices so I would be inclined to buy multiple. Also, are these the type of shirts that say small but are closer to the morbidly obese size? That's the plan! And I hear you on the size problem. The men's shirts are exactly what they purport to be, and are very well fitted (the small fits me really well, and XS is a little tight but also fits). The women's shirts are a bit on the small end. The girl who is modeling the women's black crew is one of the skinniest people I know and that shirt is a small (she normally fits into xs really well). She's also in the bottom picture (light gray) wearing a medium. 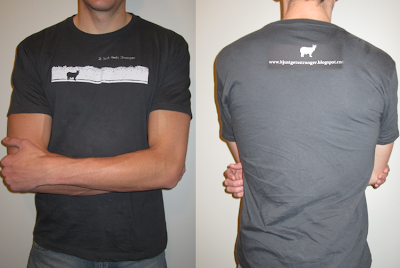 The second picture is a medium (black V) and the third is an XL (dark gray crew). Hopefully that helps! Eli, I saw this video (http://www.youtube.com/watch?v=ybVb3t560oY&feature=player_embedded) and just have one question: Why didn't you enroll the Queen of Colors in the same mediation course those two chickens obviously previously attended? Maybe that way the traumatic hair incident could have been avoided?! Warmest regards, a friend. This video has changed my life. It also terrifies me. I believe these chickens are related to the Q of C, but I don't know how to prove it. And to think I've been breaking the law all this time with my lack of clothing...tsk, tsk. ;) Love the shirts and I guess I'll mend my law-breaking ways with wearing of one soon! Yeah, I looked up the statute and sure enough, it does exists. See UCA section 76-13-5(a)(1). I'm so happy I can help keep so many people out of the slammer. Can I get that design printed on my snuggie? I'll tell you what--buy a shirt or two and I'll see what I can do . . .
Really is a good deal and excellent Shirt. affordable and cool for the hot days. very very well for fishing day or maybe another trip.